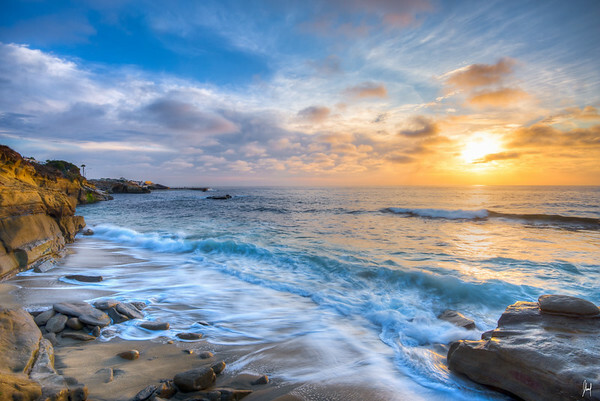 If you have noticed, many of my favorite images have come the beaches of La Jolla in Beautiful San Diego. It is a simply stunning coastline and the number of amazing sunsets I've seen there is staggering. This image was captured by slightly slowing down the shutter speed and capturing the image at just the right time when the waves broke against the shore. The idea was to capture the waves as they drifted back into the sea, leaving behind blue, silky streaks. I took five shots and blended them together to create two separate HDR images, one that was focused on keeping the beach sharp and another with a sharp sky. The final images where then blended together in Photoshop with the use of layer masks.